Lite the Fire is committed to bringing training that includes teaching, impartation and activation so that God’s people will be equipped for the works of the ministry both inside and outside the Church. 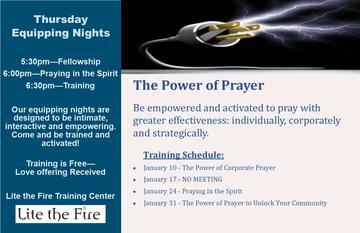 We have a specialized focus on training and equipping in all levels of prayer, strategic warfare, faith, divine healing, signs and wonders and five-fold ministry. We can also customize training to fit any size of group and gathering, we can host or you can host us! Email us at pray24-7@litethefire.org to schedule your event. Also, check out our calendar of events for more information on trainings being offered by Lite the Fire.